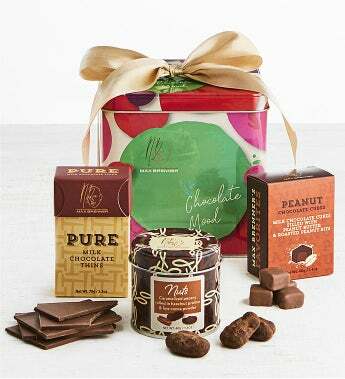 Presented in a beautifully nostalgic box dedicated to Max Brenner’s chocolate love story, this giftset contains Max Brenner’s famous caramelized pecans Nuts rolled in hazelnut praline & fine powder, Peanut Chocolate Cubes filled with peanut butter & roasted peanut bits, and Pure Milk chocolate thins. Kosher. • Gift Measures 5" x 5" x 5"